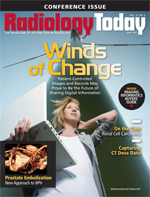 Dose reduction isn’t a new concept in radiology, but it has become a hot button issue in the industry. CT exams have been the main point of focus because they expose patients to significantly more radiation than x-ray exams, and their doses can vary widely depending on the scanner used, the exam protocol, and the technologist who performs the exam. What has become clear as the issue has gained prominence is that there have been few initiatives aimed at actually measuring how much radiation patients receive, both during each exam and cumulatively. That is beginning to change. A free, open-source application for tracking dose called RADIANCE (Radiation Dose Intelligent Analytics for CT Examinations) was launched by the Hospital of the University of Pennsylvania (HUP) in September 2010. While RADIANCE can read data from DICOM radiation dose structured reports, its more significant feature is that it can also read dose sheets from legacy CT scanners. This not only allows dose tracking from scanners that don’t support radiation dose structured reports but also provides clinicians and researchers with a broader database. RADIANCE uses optical character recognition to read the dose sheets, which are screen-capture images, and can be downloaded as a ZIP file to any Windows platform. Cook says a version for Linux and Mac OS X will be available in the future. Interest has come from all over the world, spread evenly among large and small academic centers as well as private practices. Cook says there have been more than 100 downloads since the application was launched. Anyone who saw RADIANCE at RSNA 2010 will notice a few differences. Cook and her colleagues used feedback from RSNA to refine the tool’s capabilities. One change is a more detailed version of the installation and use instructions. Another is a customizable dashboard that is built on top of the RADIANCE database. In its initial format, the dashboard has screens that can display items such as the number of exams performed, a specific exam code, or estimated dose related to an individual. However, the screens can be used to dig deeper into the data. The dashboard can be customized to look at various data sets, such as a breakdown of estimated dose by body section (eg, neuro, chest), the number of exams performed by a section or an individual over a period of time, estimated doses for those exams, doses related to specific exam codes, doses related to a specific technologist or radiologist, or dose associated with a particular patient. The variables can be combined to produce highly specific reports. Cook and colleagues recently developed a scorecard feature that provides educational information and issues associated with CT radiation. It tracks dose estimates for each individual within a department. Those estimates can then be compared with the medical literature and the scores of others in the department to find ways of optimizing protocols. That level of detail helps people focus on the important aspects of radiation dose. It’s one thing to be aware of dose reduction, but translating that awareness into specific action is the goal. Cook says HUP’s radiology department recently used scorecard data to improve chest CT protocols and achieve significant dose reductions. Cook says it’s important to keep in mind that better measurement is only one step in the process. The numbers don’t tell clinicians much about how radiation affects patients. Medical physicists are always trying to develop better parameters that represent dose to the patient and working specific organ doses, but it’s still an inexact science.